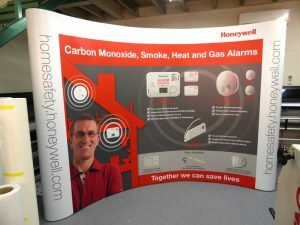 Curved exhibition stands create an impressive looking stand when exhibiting for a relatively low cost. We sell many different makes of curved pop up stands, with high quality, printed graphics that are laminated with deep textured matt laminate which not only protects them from marking but also helps to remove glare when photography is being used on your stand or at your event. These curved display stands are easy to use and are supplied within a wheeled transit case, which is designed to hold the exhibition stand hardware and all the printed graphics which roll inside each other for safe storage. Lights, and case to counter conversions are also available as optional extras on most systems, so if you want to add a graphic wrap to your order to turn your wheeled case into a small counter this is possible, and lights are available as halogen or LED on some models. Here are some links to our most popular curved exhibition stands. Quick Plus Bundle Offer – an exhibition stand special offer. Economy 3×3 pop up stand – a standard sized, curved display stand. Magnetic 3×4 pop up stand – a medium sized, curved exhibition display. Magnetic 3×5 pop up stand – a fairly large, curved exhibition stand.